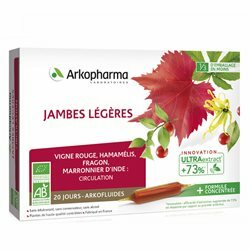 Bulbs Arkofluide BIO LIGHT LEGS LABORATORIES Arkopharma are food supplements for return to the comfort and dynamic light legs. 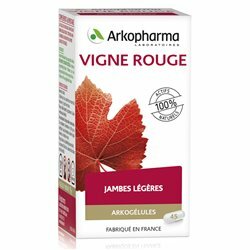 The Arkofluide BIO LABORATORIES Arkopharma range have always desired by many research to bring you the best that nature can offer, in order to find well-being and everyday comfort naturally. It is therefore natural that LABORATORIES Arkopharma turned to organic farming, in order to extract optimal nutritional qualities. This plant, anti-inflammatory will come reduce local inflammation in the legs and thereby reduce the pain, it also has a vasoconstrictor action, which is the diameter of the blood vessels in order to reduce the expansion. It improves lymphatic circulation, its vitamin D tones venous system that promotes a good return and decreases capillary permeability, which has a positive impact on heavy legs, swollen and have edema. Witch hazel reduces the caliber veins, tones the venous system, balance and regulates blood circulation, soothes aching legs and reduces the risk of developing complications due to poor venous return such as varicose veins, ulcers, phlebitis and itching. 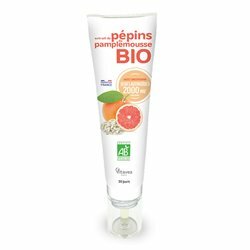 Red vine decreases the permeability and size of vessels, increases capillary resistance, reduces the risk of venous stasis by stimulating the venous return, protects the network of veins and acts on free radicals responsible for cell aging of organization. Also known as butcher's broom, he fights against inflammation and energizes legs venous return. It enhances the feeling of heavy legs and acts effectively on the different symptoms of leg edema. Bulbs Arkofluide BIO LIGHT LEGS LABORATORIES Arkopharma, will allow you to find happiness and the feeling of freedom that gives light legs with normal and dynamic traffic. No more heaviness, swelling and edema stun that spoil your daily life. Shake the ampoule before breaking tips. Pour the contents into a half glass of water.